You've got a great gaming keyboard, and now you need a great mouse to go with it? Well the Swedish company MIONIX thinks they might have the solution for you. We've reviewed their NAOS 5000 and NAOS 3200 units in the past and were reasonably pleased with their performance. And now they've just announced their new NAOS 7000 high performance optical gaming mouse. MIONIX even made a nice little demo video for you. Billed as a truly ergonomic, right-handed gaming mouse, it looks like it follows the same form factor as many other gaming grade rodents. That means that it has a full palm grip with a high point near the middle of the mouse for optimal control. The hardware used within this mouse is littered with just as many interesting specs. This includes a 7000 dpi sensor with no hardware acceleration, to ensure any movement is smooth like butter. The NAOS 7000 even has a built in ARM processor with supporting software, allowing you to customize every button, movement aspect, and even allows you to change the LED colour. The price for this mouse is suggested to be $79.99 US and it should be available this month at the usual places. More details are in the full press release below. Vaxjo, Sweden – December 4th, 2013 – Mionix, the Swedish manufacturer of professional high-end gaming accessories today unveiled the new NAOS 7000 high performance optical gaming mouse. "With our constant focus on performance, customization and comfort the new NAOS 7000 is the best ergonomic gaming mouse on the market," says Peter Nygren, CEO at Mionix. The ADNS-3310 gaming grade optical sensor delivers no positive or negative hardware acceleration, amazing accuracy, smooth tracking, and a maximum speed of ≥5.45m/sec (≥215 IPS) all the way up to 7000DPI. The lightning fast 32bit ARM™ processor enables the mouse to have many features without compromising the tracking of the sensor. The downloadable software provides access to fully customize all buttons, sensor settings, LED colors, macros and profiles. The 7 fully programmable buttons can be assigned to any key, mouse command or macro, which is programmed via the downloadable software. You can also use the buttons to switch easily between stored profiles and DPI steps in-game without taking your eyes away from the screen. The NAOS 7000 is equipped with our Surface Quality Analyzer Tool (S.Q.A.T ). Which measures the data loss between the sensor and the gaming surface. 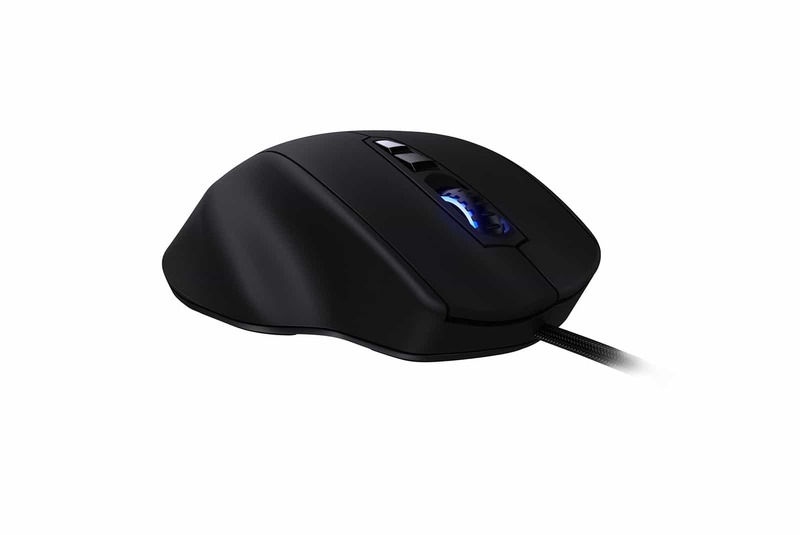 The result assists the choice of which gaming surface is best for your mouse setup.